Inspection table (Inspection Conveyor) is equipment consisting of a three-track conveyor with a hood with lighting arrangement and visual inspection background of alternate black & white color. 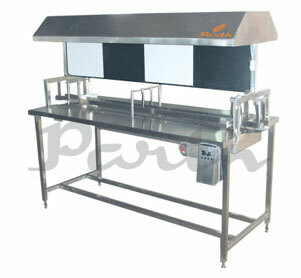 Inspection table have stainless steel structure with moving S.S. slat chain. Structure made out of S. S. square pipe & supported on adjustable bolts.The machine is customizable with its height being varied according to the consumer’s requirement. It also has a self-lubricating guide below the chain keeping it free from friction caused due to contact between moving parts of the machine. The machine boasts of an elegant SS Matt finish giving it a splendid appearance. The conveyor belt has a provision for variable height, making it an effective machine useful for multiple dimensions. Construction of machine has been done rigid in order to make sure that the machines carry out operations without producing any vibrations for a trouble-free performance. Gross Weight 425 Kgs. Approx. * Depends on operator, bottle size etc.